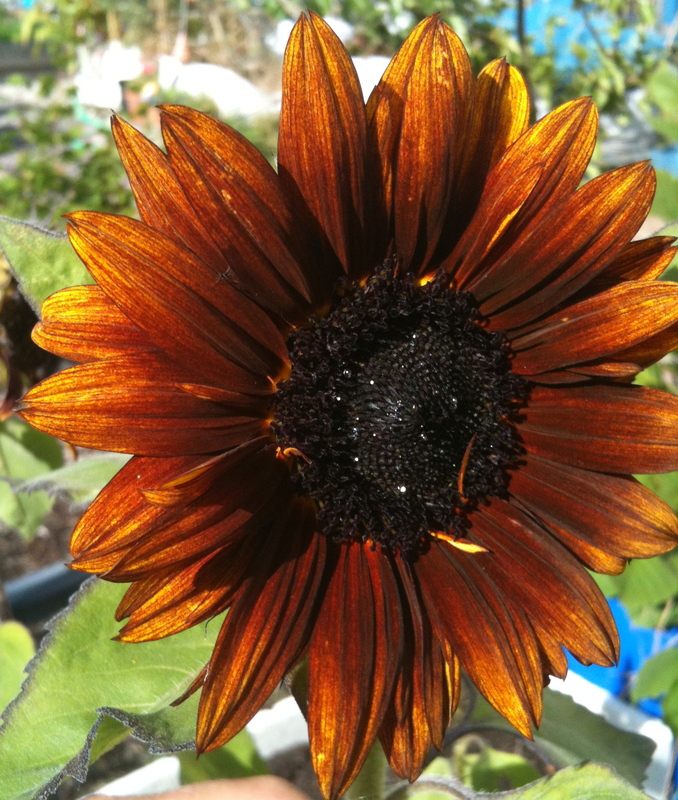 Days are growing shorter and some plants look straggly but nonetheless the garden still looks alive and loved. This years successes were curly kale, peas, sweetcorn and (mostly green) tomatoes but the usually reliable beans and courgettes were few and far between. On the whole the sudden late hot summer hasn’t resulted in a great harvest – perhaps because winter hung on too long so we didn’t get the good start we’d hoped for. It seemed that snails and caterpillars were the big winners this year as they’ve chomped their way through all our brassicas and are now enjoying the ripening tomatoes. We’ve all experienced the disappointment of reaching down to pick a luscious tomato only to find the ripe and ready beauty has already been devoured inside from the bottom up. Sneaky. Flowers bloomed in the meadow and around the garden and really did seem to lift the spirits of everyone passing by. We’ve held two Saturday events in the past month with the help of funding from Southern Water. These follow the Feastie Beastie kids event and we have one more planned – A Harvest Celebration with pumpkin carving where we will join up with The Bohemia Walled Garden – details will be on our Facebook page. 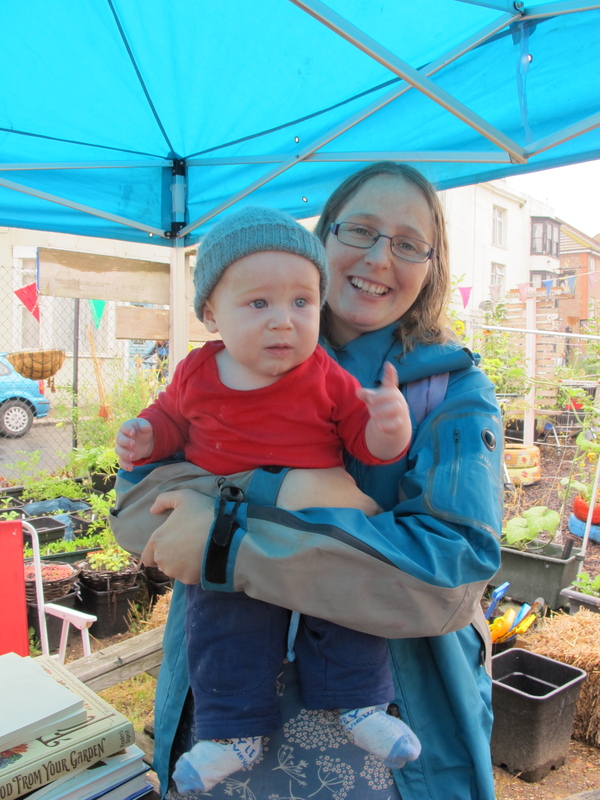 Our Herb Day must have been the rainiest event day yet – ironic that it was sponsored by the water company! 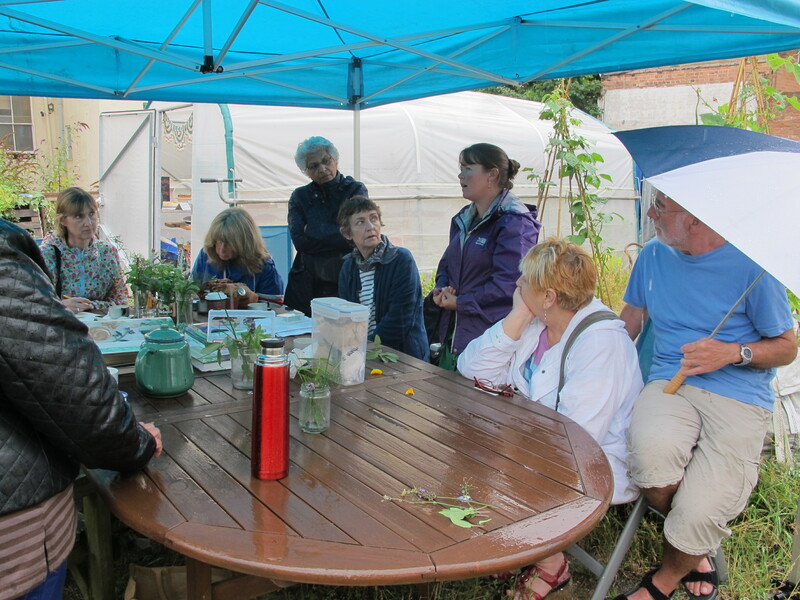 Undaunted, we gathered under the larger gazebo and listened as two experts gave fascinating talks on different aspects of herbs. 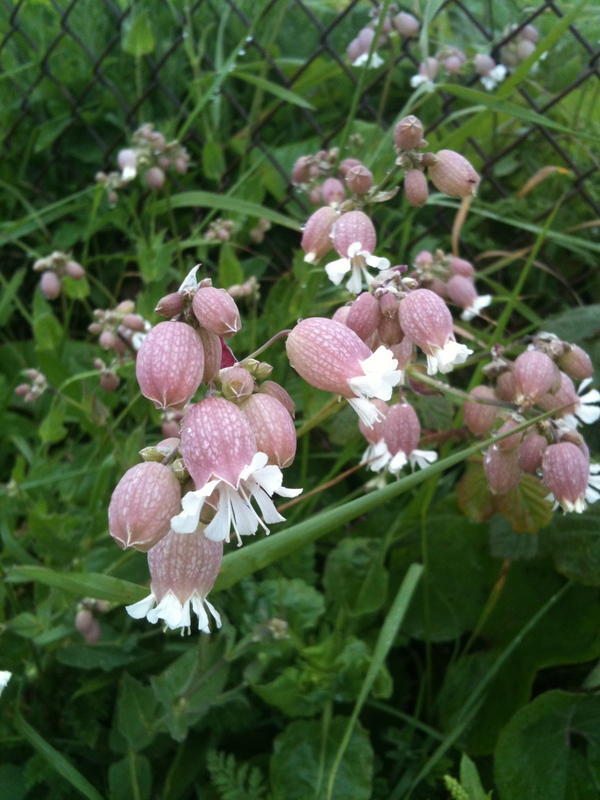 Jackie is a medical herbalist who introduced us to easy-to- concoct herbal remedies and suggested ways of supporting good health by treating ourselves with the plants that nature has provided. 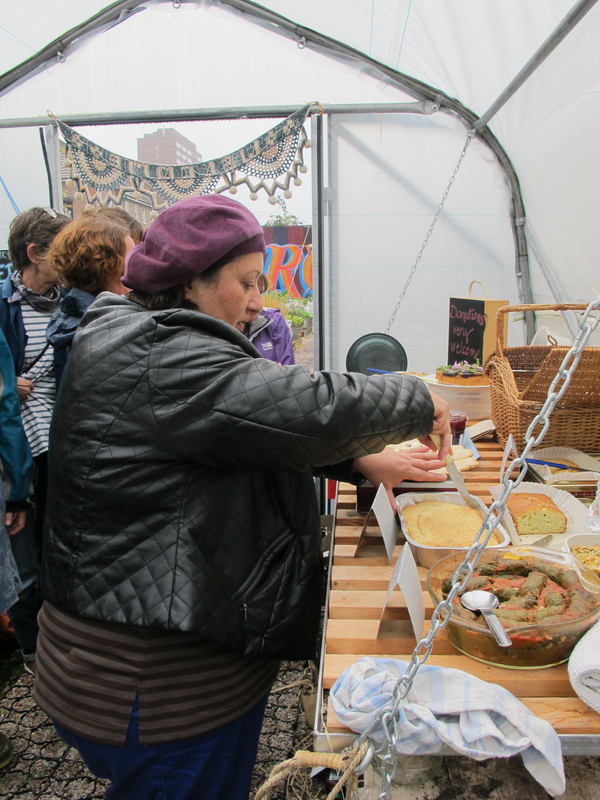 Then we all made a dash for the polytunnel to enjoy lots of herb themed goodies that the garden volunteers had made. 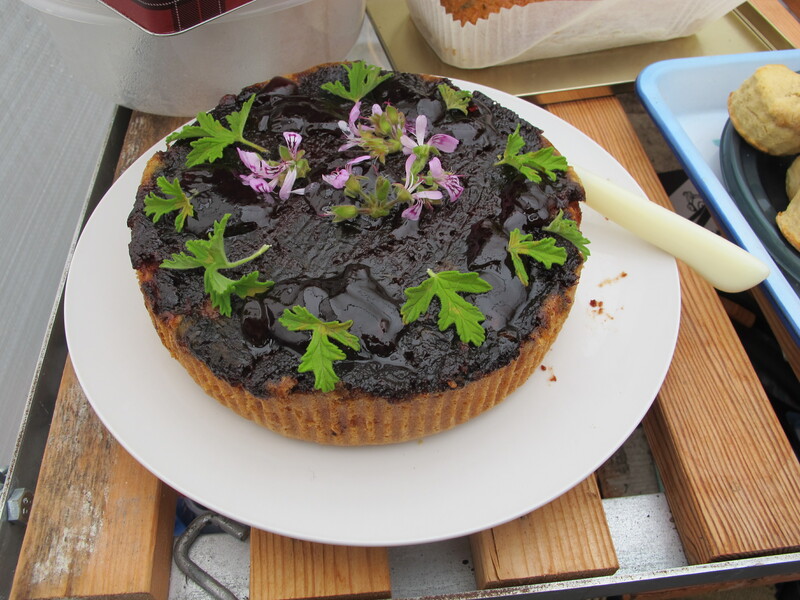 Savoury flapjacks, rose geranium and quince cake, rosemary and walnut shortbread and lots more served with freshly made herb teas got us in the mood to hear Elaine tell us about growing herbs and designing a great herb garden. 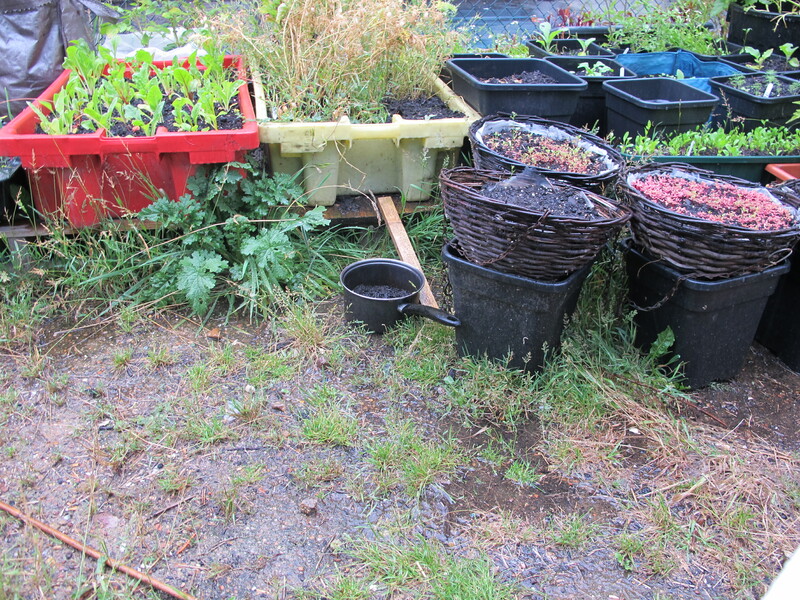 Eventually the unstoppable torrential rain got the better of us and everyone went home a lot wiser but desperately needing to also be a lot drier and warmer as well! Our most recent event was ALL ABOUT FOOD! The garden was open for EDIBLE GARDENS 2013 which is part of The Big Dig, a national movement to encourage people to grow their own food on allotments and in community gardens like ours. 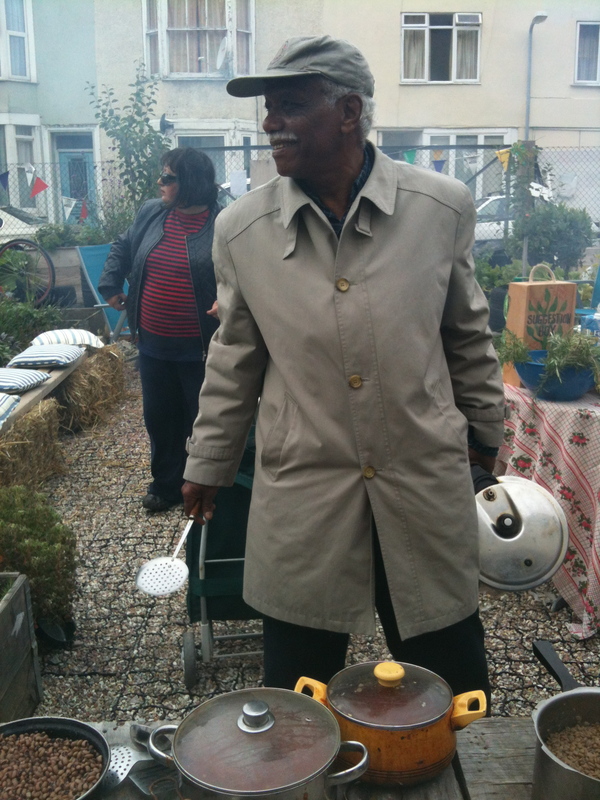 The weather was a lot kinder to us this time, which is just as well with outdoor cookery as the theme. We had a mention in the press and posters were up around town so there was a good turnout including Council Leader Jeremy Birch Council and representatives from our event sponsors, Southern Water. Hafiz provided a typical Sudanese vegetarian feast served with rice from our friends at the Laskshmi Mahal. Jan made a big pot of delicious minestrone using vegetables she’d picked that morning. 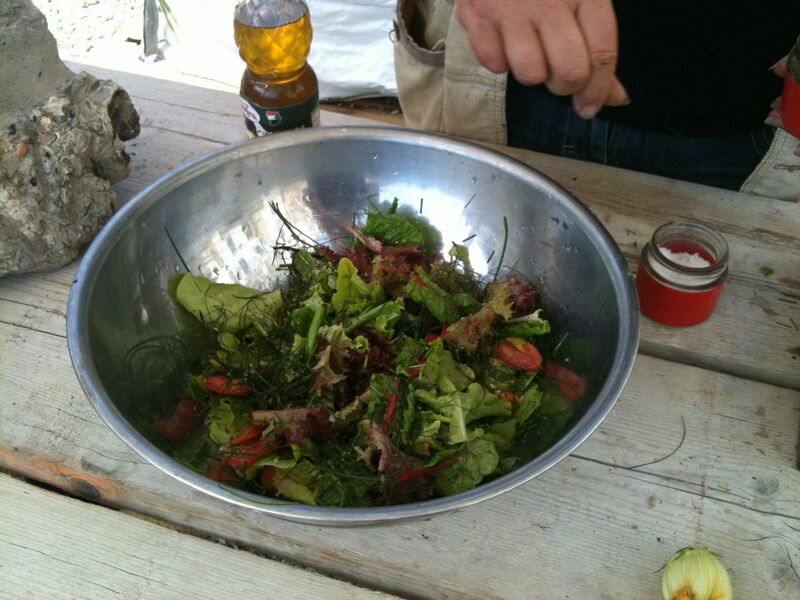 We also had salads from Mooses’s Kitchen and plenty of teas brewed up by Peter who kept the Kelly kettle boiling all afternoon. Most of all we had lots of happy people in the garden, sitting on straw bale benches chatting to each other, making friends and enjoying a meal together. This is what the garden was made for. 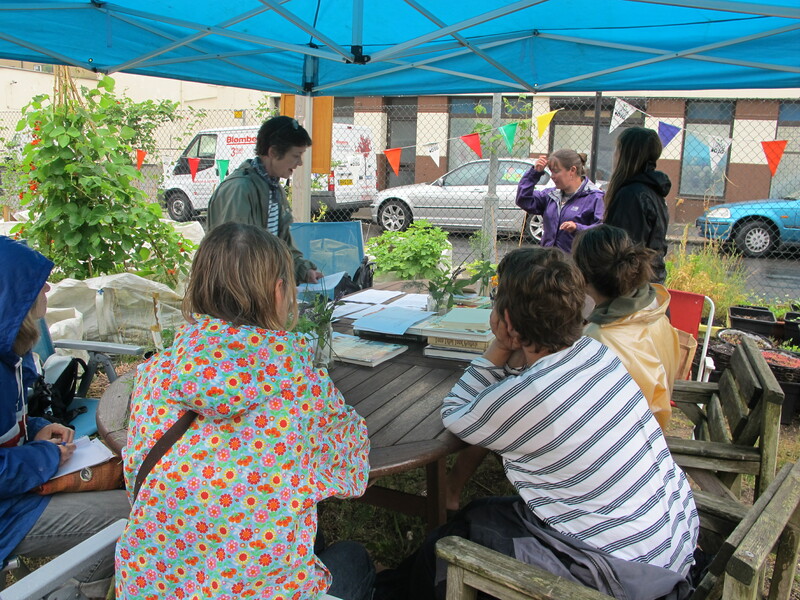 Next Saturday The Moveable Feast joins up with a garden themed exhibition as part of Coastal Currents. Dora and I are recreating the garden shopping trolley logo as an exhibit. Photo’s will be taken if it works – if not less said the better! We haven’t had any news about a date to leave the site so plan to stay put until the time comes. We certainly wouldn’t want to pack up and go only to see this inspiring space return to the state it was in when we started here last April. For now all we can do is carry on as usual and see what the future brings. The garden was buzzing today. The marjoram was covered in bees and there was a also constant stream of people coming in through the gate. There were new visitors and familiar faces, people with their dogs, a lady on a mobility scooter and her helper dog and a nice chef on a bike. Our artist neighbour Tim, with his dog, who had locked himself out and needed just the right stick to help him get in and the local blacksmith who cut down some oil drums in exchange for a nice bright blue one of his own. 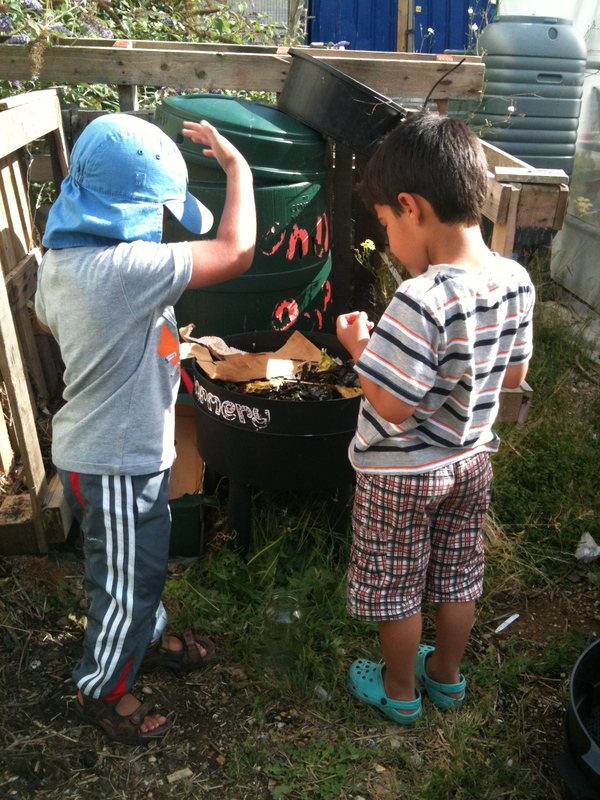 A friendly gardener presented us with a tub of Vaseline laced with copper sulphate to deter slugs and we were also instructed on how to make a stinging nettle fertilizer solution. We made Lemon Verbena tea and sat in the shade talking and listening. There’s an archaeological dig going on near Seddlescombe, which we heard about because a friend dropped by to ask a question about suitable seeds to sow in the Autumn. Times slows down without constant reminders from ticking clocks and radio news bulletins on the hour. 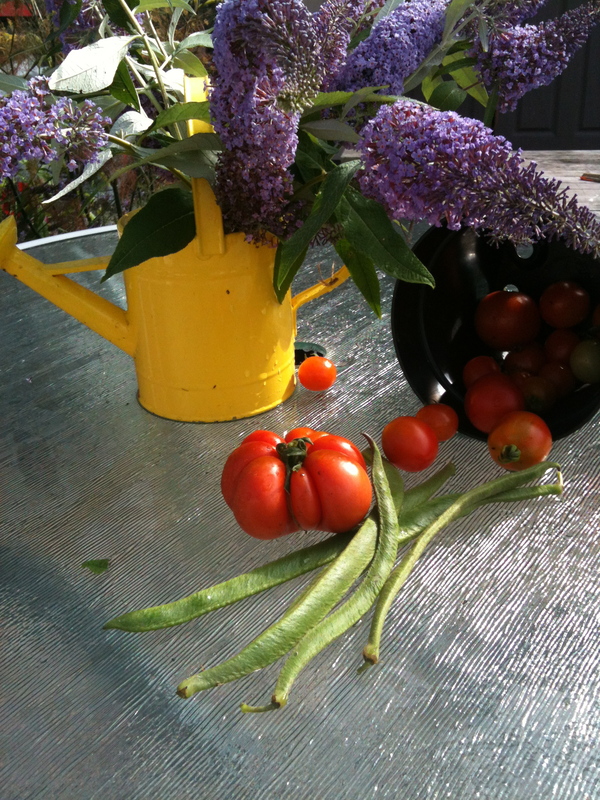 The hot sun is working its magic and reluctant tomatoes are beginning to ripen. Its hard to believe that we have only been open for nine weeks. In that short time we’ve grown chillies, beetroot, corn, cucumbers, cabbages, leeks, chard, herbs, sweetpeas, beans, squash and one miraculous cauliflower. And many new friends. Everyday someone new bothers to walk through the gates to tell us what a great job we’re all doing and what a difference the garden has made to the street. It’s simple and true that people like watching plants grow. 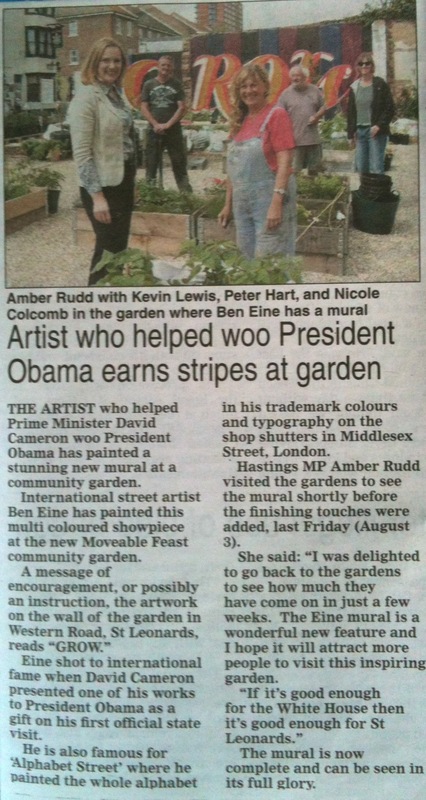 We made the local Observer again this week when our MP Amber Rudd paid us a visit to admire the “work in progress” mural. We’re expecting the Obama’s motorcade down Western Road any day now! 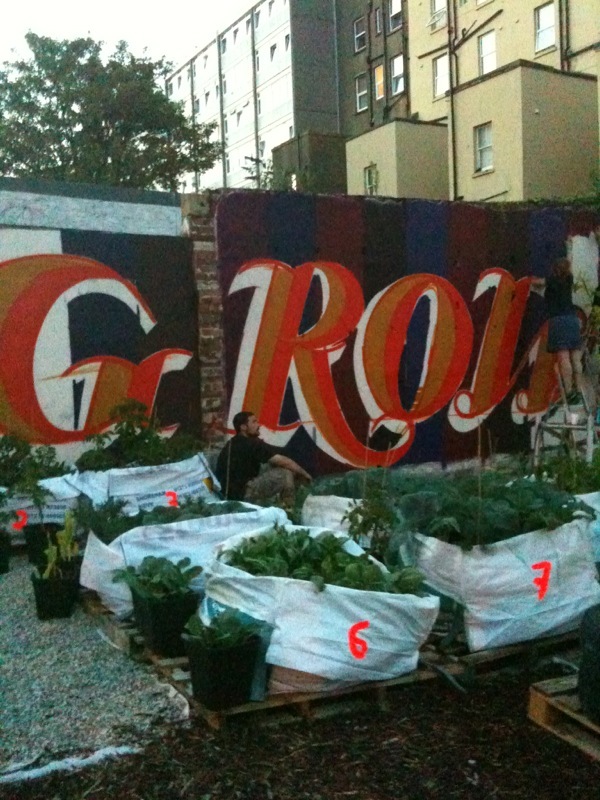 Our wonderful BEN EINE mural is complete and will brighten up even the darkest of days. Days spent in the garden without clocks or hourly news bulletins seem longer but really, we could do with starting August again. Rewind. It is hard to believe we only opened the gates 6 weeks ago but we’re reminded when new people discover us and are staggered by what’s been achieved. But oh to start August again – that would be lovely. It’s not that anything’s gone wrong, just that we need more summer days so our corn grows taller and pumpkins get fatter. 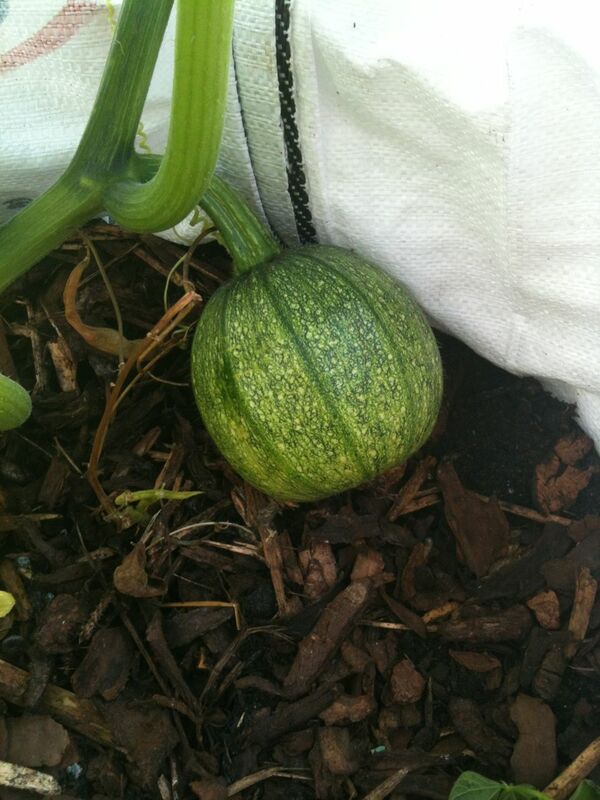 Thank goodness we planted courgettes in all shapes and sizes because they grow while your back’s turned! Jan discovered this beauty on Saturday. 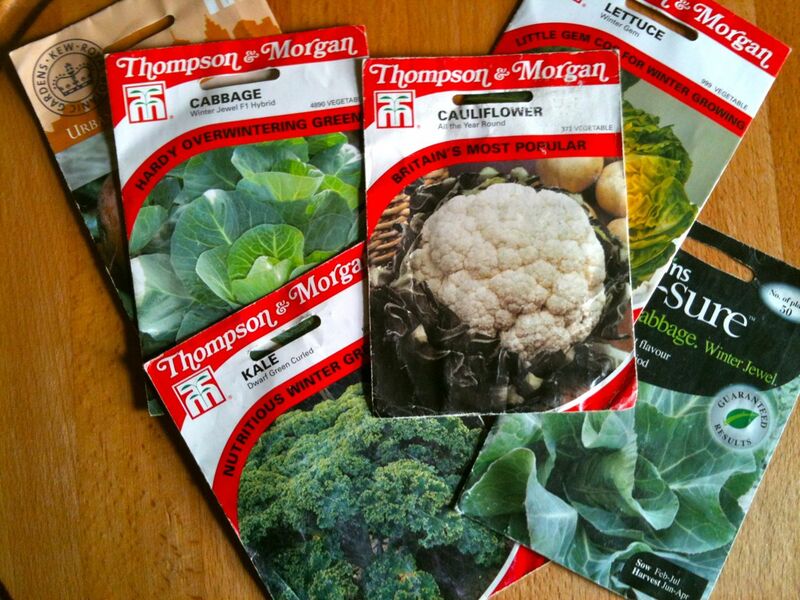 We’ve been mulling over what seeds we should be planting right now and the names on the packets are getting me down. They all have winter in the title but I guess that’s what seasonal vegetable gardening is all about. Looking forwards. 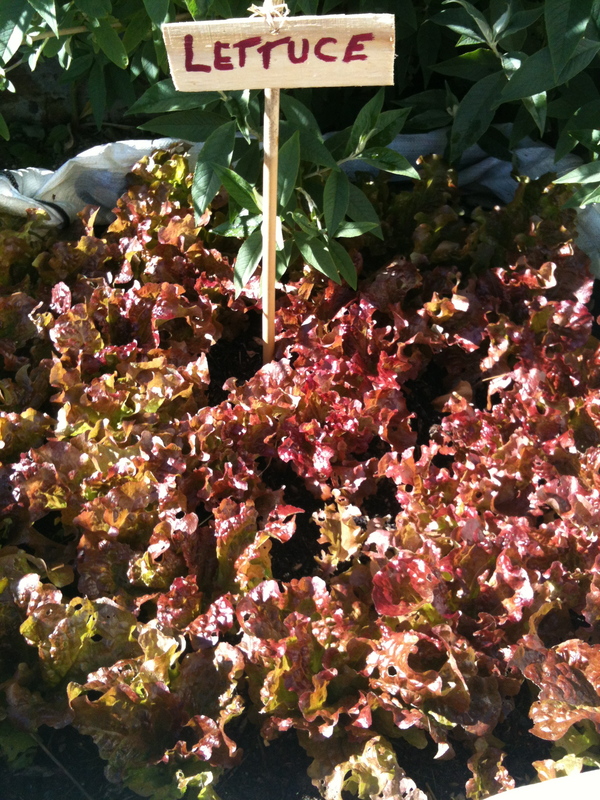 Right here in the present though we are loving our sun-trap garden and noticing some big advantages to growing in containers – there’s no digging, no weeds and not many slugs take the long slide across the shingle paths. 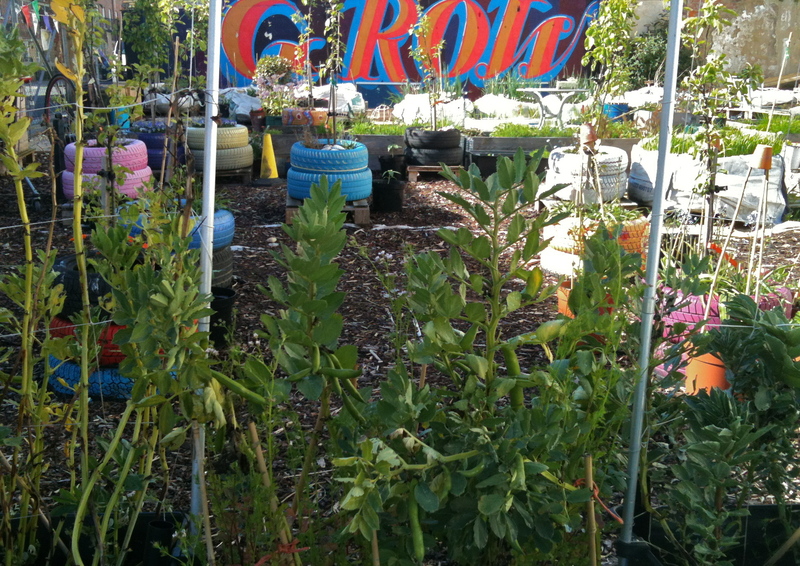 Rick from Smith’s Real Food is keeping us supplied with fresh coffee grounds to sprinkle around vulnerable plants. Apparently slugs and snails don’t like a caffeine buzz. 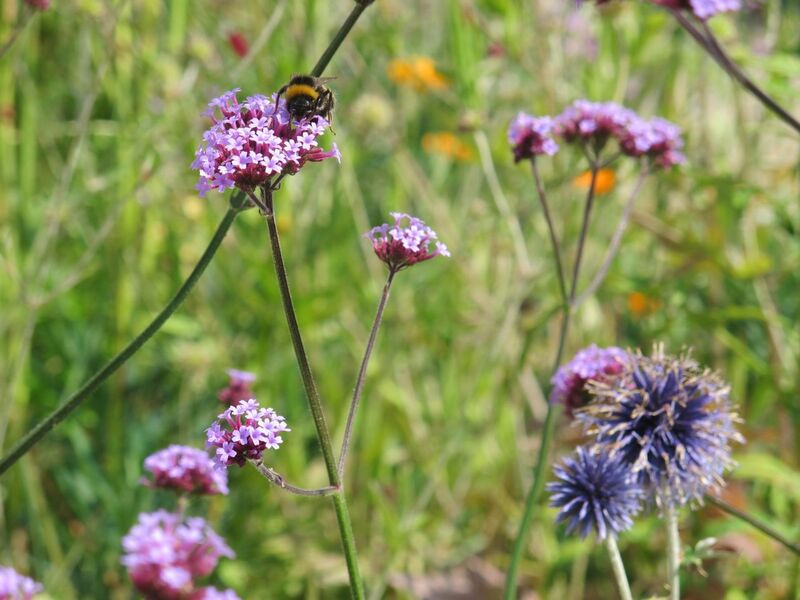 But bees sure do love the Verbena. 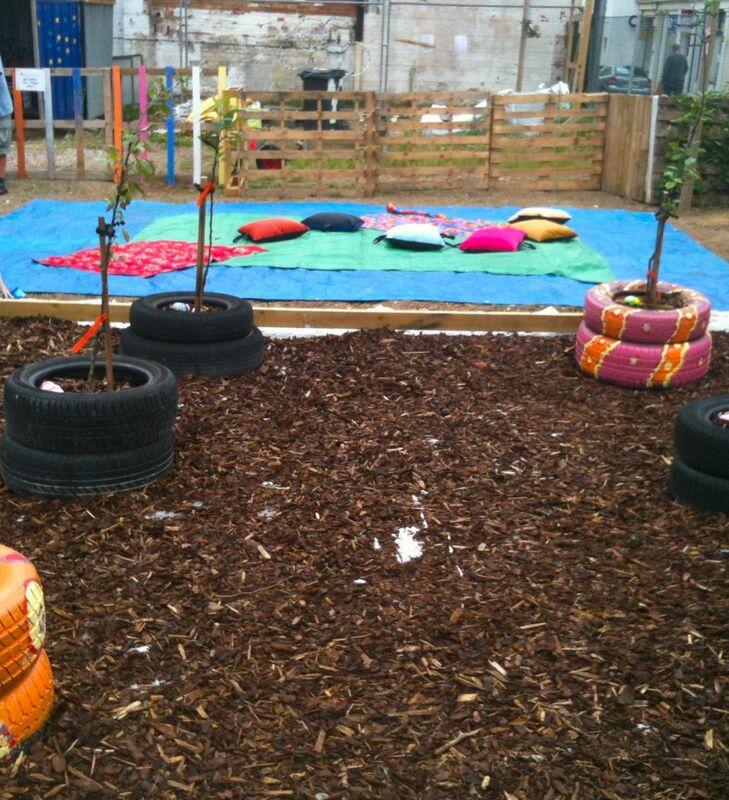 Last week we had the first children’s playtime in the garden. Lesley Lambeth invited families from the Fellowship of St Nicholas along and it was magical to see the little ones making mud and getting grubby. 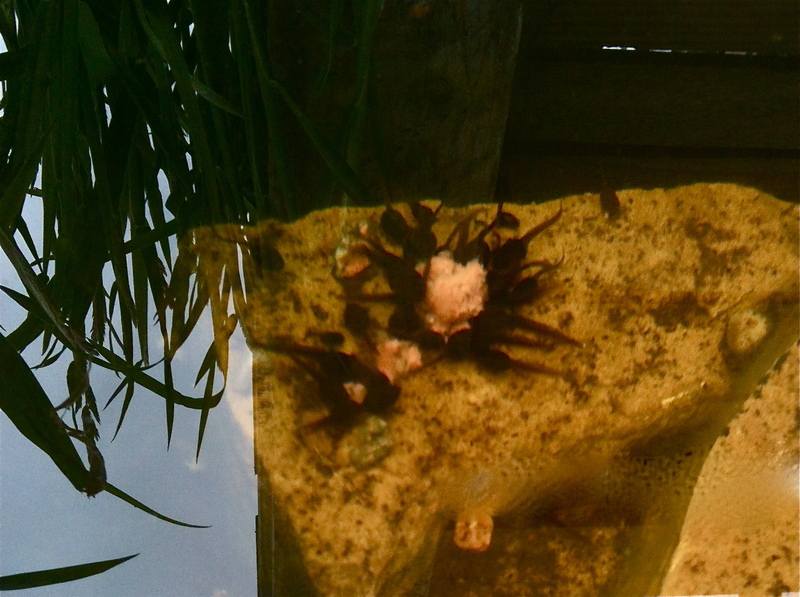 They’re not invisible – this was taken before they arrived! They’re back with us on Thursday so fingers are crossed for sunshine and lots more happy little people. 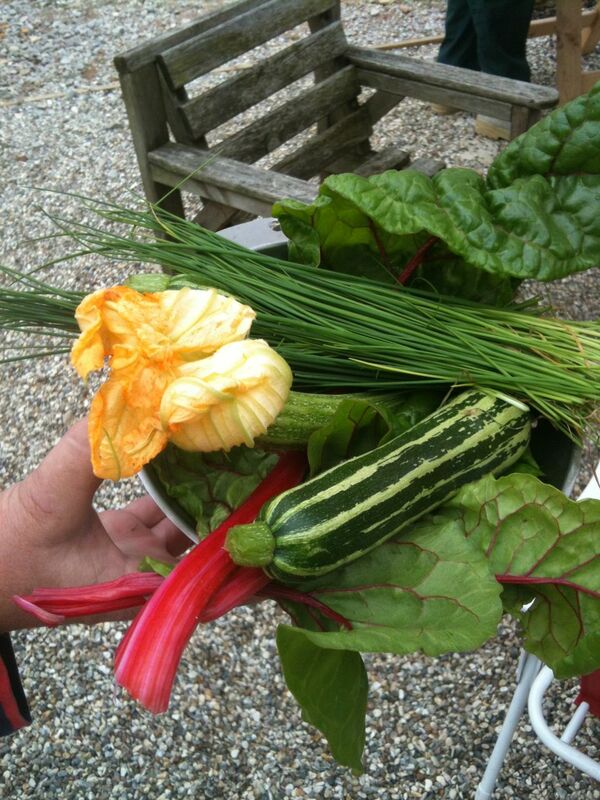 Cat is the member of our group who works culinary magic with garden produce. 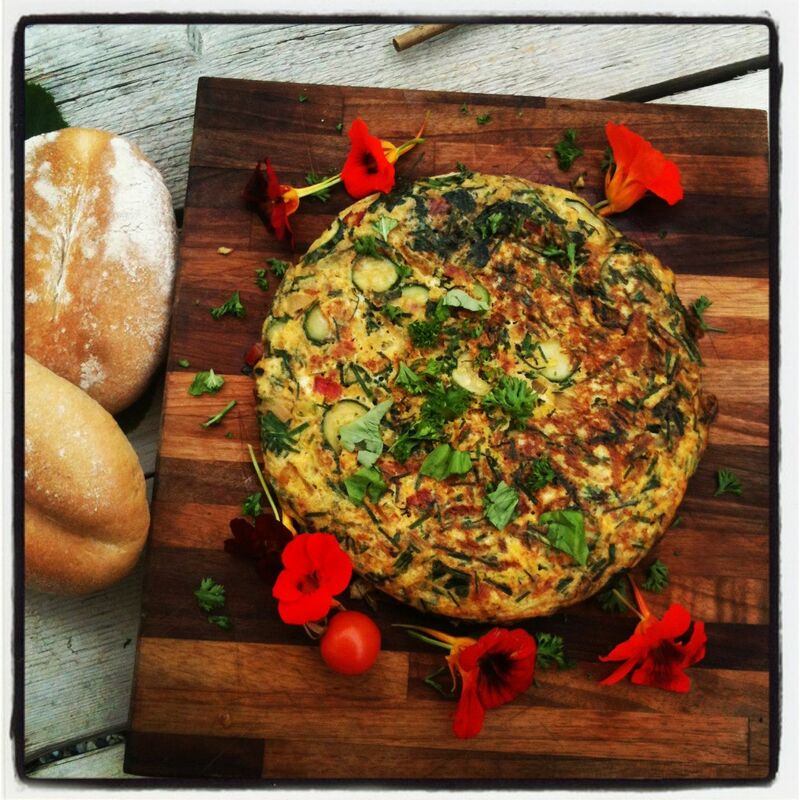 She grabs a handful of this and a pinch of that and suddenly we have a Frittata or a gorgeous salad bursting with funky flavour combinations that most of us would never have thought of. And so beautifully presented. 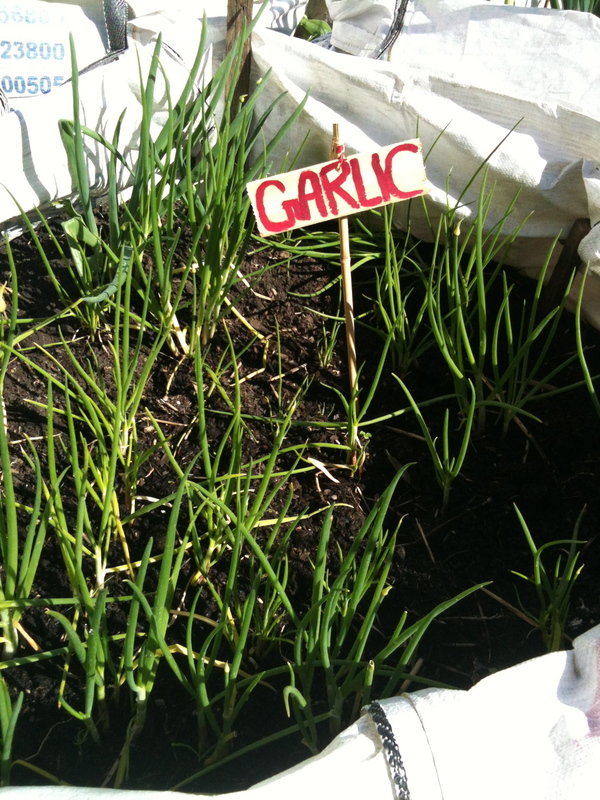 …and finally there’s great news of a different but equally satisfying kind. Our ‘campaign’ to have to public loo’s around the corner from the garden re-furbished has been a success. The Council have received the message loud and clear and work will begin soon. RESULT ! Ahem. Thanks to everyone who got behind this. 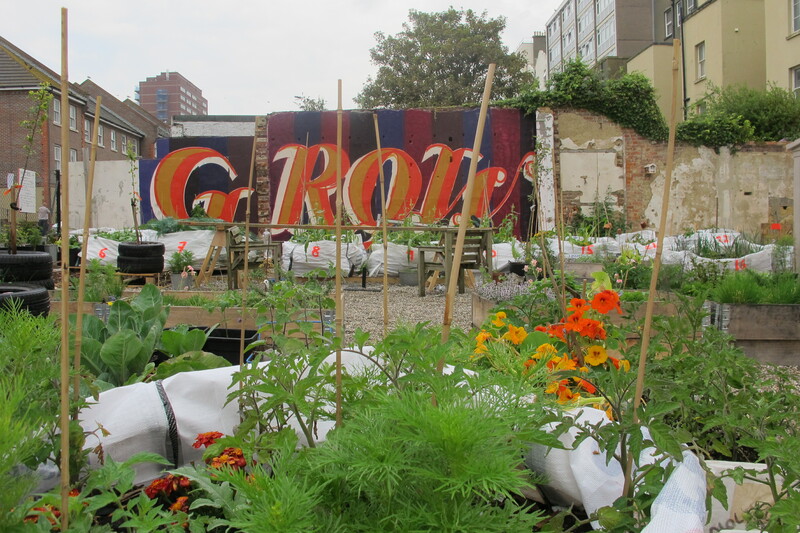 It’s almost a month since our opening party and the rain eventually stopped only to be replaced by a heatwave. Plants love this sort of crazy weather behavior and they’re rewarding us by growing in front of our eyes. 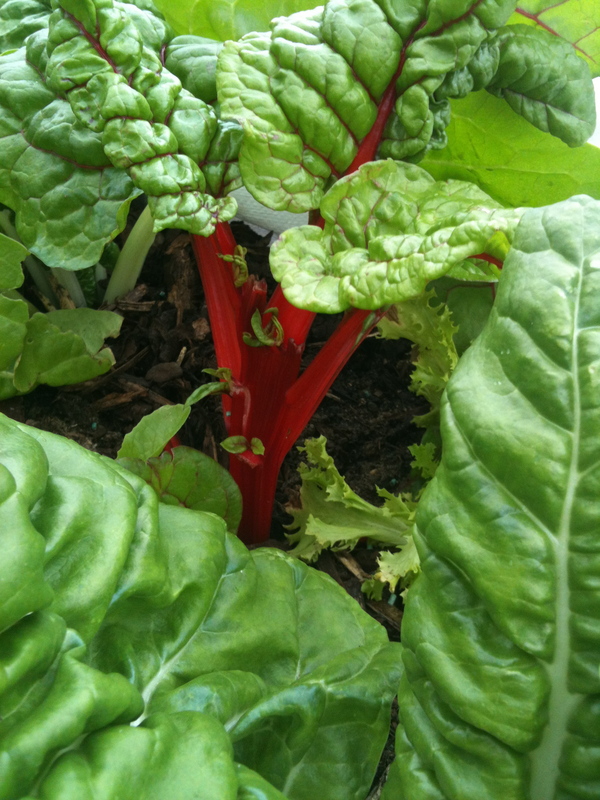 Ruby Chard wins the beauty contest and the Giant Bed of Mints get the aromatic award. 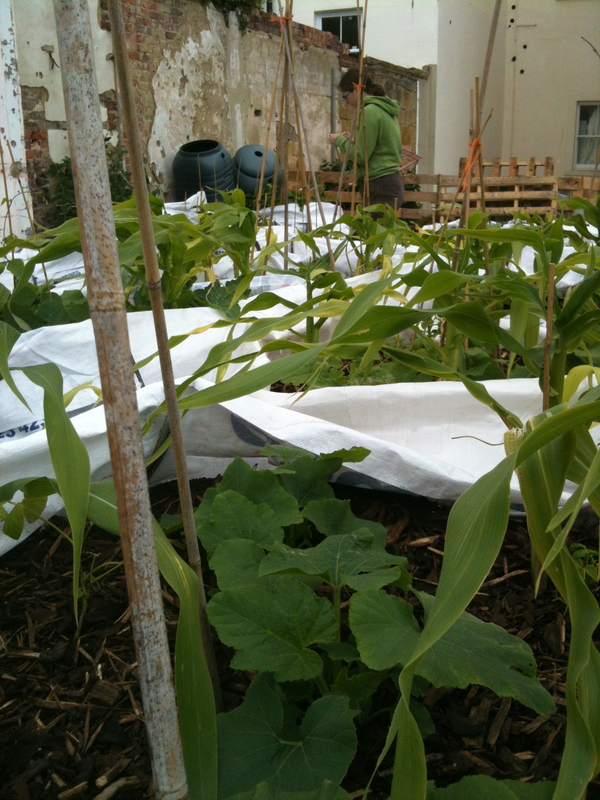 Rescue Corn was plucked from ta nursery’s compost pile by Dora who brought it back for some TLC and there are green shoots! Our beds of Three Sisters Veg are thriving although Sister Bean was too weak to cling on in the gales and we’ve had to plant afresh. 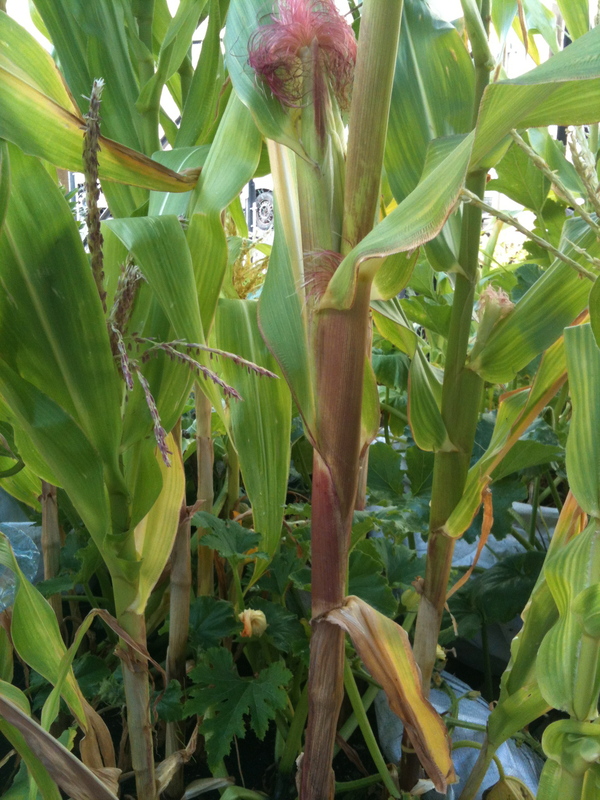 The seedlings are doing well and will soon be clambering up the corn. took away a selection of cabbage leaves and returned with a most delicious curry for our lunch. She shredded cabbage and fresh coconut very finely and gently fried it up with mustard seeds and served it to us with fluffy rice. And I was too greedily eating to take a picture but I will next time. We’ve had a week of ups and downs. The meal on Tuesday made us feel that we are already achieving more than we dreamed of. 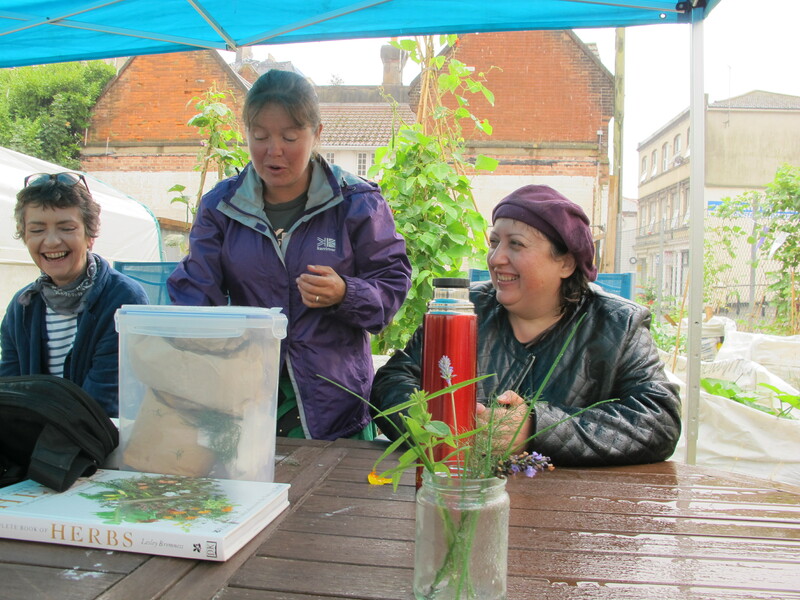 The garden was buzzing with activity with new plants being donated and a nice new sun umbrella bought with donated funds to shade our first garden meal. New people discovered us, we had visits from our friendly local police and were able to give out fresh herbs and salad leaves for visitors to take away. After a day like that we were shattered to discover that we had to close the garden for two days over an insurance issue. The Public Liability cover we thought we had would not be valid without another piece of outstanding paperwork and there was no option but to lock the gates in a heatwave. The site owners Roost came to our rescue and sent Mark their Maintenance Manager over to water the garden and the plants could almost be heard to gulp and relax. After a tense day and Sarah’s persistence, the new insurance came through at about a minute to five yesterday evening and we dashed in to water after another scorching day. We’ve been keeping this a secret, but I began pestering graffiti artist Ben Eine through his assistant Steph, back in April. Ben is famous for his huge drop-shadow letters often seen on shop shuttering in East London and Hastings/St Leonards. I sent photographs of our wall to tempt him then updated them as we cleared the space . He said he would come and paint and we decided on the word GROW. Then we waited for our Planning Permission to come through and eventually it did at the begining of June and so did the rain which came down relentlessly. Every time Ben was in the country the rain was too and the prime growing space along a nice warm sheltered wall was becoming an issue. Other wall painters offered their services but I knew that if only the right weather and a gap in Ben’s busy schedule could coincide, it would happen and be worth the wait. Well, last night Ben and his assistants painted our wall. It’s not quite finished as bad light stopped play, but they’ve promised to return sometime over the next week and after a complimentary meal at the Taj Mahal, I’m guessing they’ll want to comeback to Western Road quite regularly. 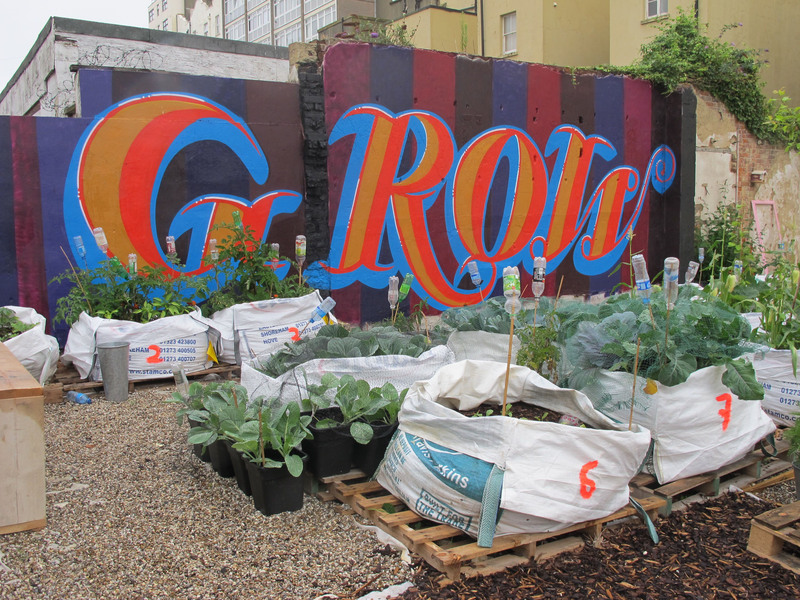 Our garden and its wonderwall have shone a very bright and positive light onto Western Road and its getting better all the time.